What became of Boston’s brightest? This story was reported by Globe staff writers Malcolm Gay, Eric Moskowitz, and Meghan E. Irons. It was written by Moskowitz and Gay. OKINAWA, JAPAN — Standing at the kitchen counter, Michael Blackwood sliced a plantain the way his mother used to in Jamaica. As it browned in the pan, the sizzle of oil and sweet aroma mingled with the laughter of his two boys playing in the living room, drawing his wife from the bedroom on an unhurried Saturday morning. Wants to be a doctor; mother died during pregnancy. What it did not say was this: Michael was 6 when he woke to the sound of his mother crying in pain in a little house with no electricity, no phone, and water that ran from a drum, in a Montego Bay neighborhood tourists tended to avoid. By the time they found a neighbor who could drive her to the hospital, it was too late. You could draw a straight line from that night to his high school graduation, a decade’s worth of determination and academic success in between. Now he is 30, and the memory of his mother’s death remains vivid. Reading her name, Joy, tattooed down his left forearm, he faltered, trying hard to maintain composure. But all the valedictorian stuff? That feels like someone else’s story, ancient history halfway around the world. 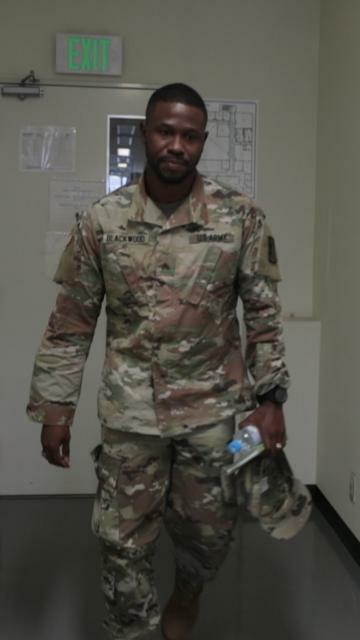 Looking at the 2006 display for the first time in years, Staff Sergeant Michael Blackwood of the Army’s 78th Signal Battalion examined the young man with cornrow braids and a shy smile about to head off into the world. Over the past year, the Globe has tracked down 93 of the 113 valedictorians who appeared in the paper’s first three “Faces of Excellence” features from 2005 to 2007. We wanted to know, more than a decade later, how the stories of Boston’s best and brightest were turning out. These were the kids who did everything asked of them and more. Some arrived as refugees, their childhoods abbreviated by war and poverty. Others navigated broken homes, foster care, and unspeakable street violence closer to home. Still others charted a clearer course, their academic rise fueled by family expectations and strong support. These photo displays project an unspoken faith that the American dream is alive and well: Nearly 80 percent of the valedictorians we interviewed became the first in their families to go to college, an achievement often crowned by a generous scholarship. But in an era when social mobility is in sharp decline, many of Boston’s valedictorians struggled after high school, their vaulting ambitions running headlong into a thicket of real-world obstacles — obstacles their wealthier, often white counterparts in the suburbs much more rarely encounter. Theirs are stories of inequality not just in income, but in opportunity. On paper, no students in Boston are better positioned for upward mobility than its valedictorians. In reality, many saw their opportunities begin to diminish soon after high school, perpetuating an epidemic of thwarted potential among young Bostonians. Many arrived at college only to learn the city’s chronically underperforming schools had left them woefully unprepared for the academic rigors ahead. Some lost scholarships. Others suffered depression and social isolation as they attempted to navigate a world entirely foreign to them, crushing in its demands and aura of privilege. Many ultimately transferred to lesser schools. Fully a quarter failed to graduate from college within six years, above average for all students, but below expectations for the best. Those who made it to commencement often discovered, only then, their entire lack of professional networks to lean on as they graduated into the worst economy in generations. Others, once intent on a career in the sciences, ended up in majors that locked them out of some of the new economy’s most remunerative jobs. To be sure, there are some clear success stories, many from valedictorians at the city’s pilot and elite exam schools. Carla Li of Boston Latin School cofounded a teen leadership program in China while studying at Harvard University. Belén Pereyra-Alem, an undocumented immigrant who became valedictorian at Boston Arts Academy, is now a dancer with Alvin Ailey American Dance Theater. At the other end, some valedictorians have met only hardship. At least four have experienced homelessness since graduation. One has spent time in prison; another has died. Far more, however, have navigated a gantlet of challenges to reach a quieter kind of success than they had once imagined for themselves. No valedictorian embodies this story of rattled confidence and resilience more than Michael Blackwood, who is today a world away from the physician’s life he anticipated when he set off for Boston College. Blackwood is one of nearly two dozen of the Boston valedictorians who dreamed of becoming a doctor: Today, neither Blackwood nor any other Boston valedictorian interviewed by the Globe has earned a doctor of medicine degree. While no two of their stories are the same, many ran into roadblocks like those encountered by Blackwood — a cascade of social alienation, debt, family pressures, and academic anxieties that their more affluent peers often sidestep with financial and other assistance from parents who can help guide the way. Over time, these obstacles can hobble even valedictorians, yielding fewer choices, fewer opportunities, and, ultimately, a diminished shot at economic success. Of 77 city valedictorians who shared salary numbers with the Globe, 40 percent earn less than $50,000 a year — a figure that may have sounded like a lot in high school, but today is roughly on par with median per capita income levels in Greater Boston. Today, just 1 in 7 of these valedictorians makes more than $100,000 a year, and just more than a quarter have gone on to earn advanced degrees. By contrast, the Globe interviewed 65 valedictorians from the same years in randomly selected suburbs around Boston — everywhere from Ipswich and Westwood to Lawrence and Lynn — and their accounts proved perhaps more in line with what one would expect from those at the top of the class. More than a third of this suburban group reported making more than $100,000 annually. Two-thirds have advanced degrees. Eight are medical doctors. Blackwood, the 2006 valedictorian at Hyde Park’s now-closed Engineering School, already faced an increased risk that he’d struggle economically, studies show, both because he grew up in a low-income household and because he’s an African-American male. 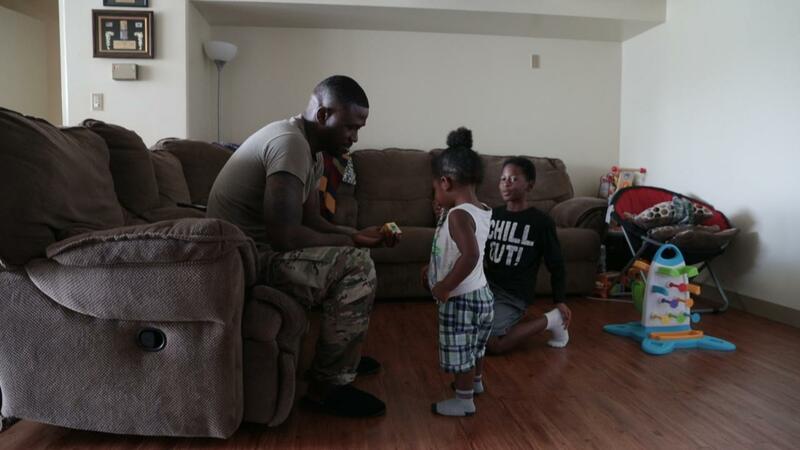 Today, with housing and other benefits provided by the Army, Blackwood is far from poor, but with an annual income of roughly $30,000, his family of four remains on the periphery of the middle class. In a city where some parents spend years charting their child’s path to the right high school, Michael Blackwood arrived at what was then called Hyde Park High School by chance, a few weeks after moving to Boston. He had spent his middle school years near Orlando, where he and his older brother Rohan lived with extended family and made the honor roll. In the summer of 2002 they visited their father in Boston, where he had gone years earlier to work in construction. They expected to remain only a week, but their dad — married with four other children — asked them to stay. Rohan, a junior, ended up at South Boston High. Naturally gregarious and eager to make friends, he fell in with the wrong crowd and began a slide that would end with his death in prison at 28 in 2014. Michael Blackwood kept to himself at Hyde Park, surprised at how easy classes were when he enrolled in a pre-biology course that was filled with second-year freshmen repeating the course. The room’s other newcomer was the teacher, Robin Barnes. Lee had imagined the best students might get picked on for trying or caring too much. Not 14-year-old Michael Blackwood — focused, prepared, serious, quiet; he never spoke unless called on. It wasn’t long before even the 16-year-olds in class were calling him “Mr. Blackwood,” she recalled, a sign of respect. In time, friends recruited Mr. Blackwood for football, where his speed, agility, and hands made him one of the team’s best players, attracting interest from a couple of local colleges. He politely declined, dreaming of attending a big university as a pre-med, preferably somewhere warm. Boston College, 7 miles and a world away, wasn’t on his map. But a guidance counselor encouraged him to check it off on the Common Application and to write his essay about his mother’s death and his motivation to become a doctor, something he didn’t often share. Then he got in, just as he did almost everywhere he applied. Based on family income and ability to pay, the amount he would owe for tuition, room, and board was nearly zero — a rare full-need grant. It was a no-brainer, everyone said. Graduate debt-free from a place like BC, and you’d be well positioned for medical school. Like so many of Boston’s valedictorians, Blackwood arrived at college a recruiter’s dream: a success story worthy of a Horatio Alger novel whose high school performance strongly suggested a smooth path in college. And like so many of Boston’s valedictorians, Blackwood soon found himself at sea, flummoxed by the blizzard of choices and decisions he now had to make for himself. He arrived in Chestnut Hill at the end of the summer, wending his way amid neo-Gothic architecture and manicured lawns, hauling his bag stuffed with oversized T-shirts, baggy jeans, and crisp fitted hats into a world of Patagonia and J. Crew. He was glad he had opted for the college’s multicultural hall, where he bonded with other freshmen, speaking candidly about their experiences trying to choose a path through a world so strange — and so white. Classes were a revelation — and an uppercut to the jaw. He discovered a love for philosophy, but he couldn’t believe how quickly his biology professor churned through so much dense material, in a vast auditorium full of students who all seemed to know it already. “I felt like Hyde Park High School did nothing, really, to prepare you for a school like Boston College,” he said. Blackwood began recording lectures so he could listen to them again, eventually becoming a steady B student. Nevertheless, he was in such a hole from his first disastrous biology midterm that he withdrew from the class rather than risk a med school-killing C or D. The recordings also helped when he dozed off from exhaustion now that he had made the football team as a walk-on — the practice squad, with all the work but little of the glamour. Want to support more investigations like this one? So it went until sophomore year, when the ground gave way beneath him. First came family catastrophe: Rohan killed two friends, and nearly himself, in a high-speed accident on Blue Hill Avenue, his car crowded with people, alcohol, and weed. Rohan had invited him out that night, but Blackwood had passed, to rest, study, and see his girlfriend, an end-of-summer fling who lately had become a source of stress. A few weeks later, he received a different kind of shock: The woman was pregnant. She was sure the child was his. She wanted to keep the baby. He was terrified, furious at himself. For so long he had nurtured a vision of himself in a white coat, treating and saving people like his mother — so that fewer kids would grow up like he did, trying to remember the warmth of a hug or the sound of a voice. But that would be worth nothing if chasing his dreams meant shortchanging his own child. He resolved to quit football, work as much as he could, and when the time came, move home. He would try to stay in school as a commuter student, part time if needed. It was a plan that could work, but left him miserable. He vented on Facebook: Michael Blackwood “is screaming [expletive] the world and everything in it.” Soon he was clocking 70 hours of work a week — as a tutor, a paid intern, a cashier at Walgreens — while carrying a full course load. He posted a sonogram image that winter, and a photo of himself standing beside the baby’s mother. She smiled. With his head cocked to the side, he looked chastened, maybe chagrined. Robin Lee, his high school teacher, saw it, and it just about knocked the wind out of her. In the delivery room in May, holding his son Amari for the first time, he felt something profound. Doctor or no doctor, he would provide for this boy — giving everything he could to graduate on time and get a good job: Amari, he promised, would grow up with more opportunity and comfort than he did. Back home with family and a newborn to raise in 2008, Blackwood could feel his dreams beginning to slip away, working multiple jobs and fighting traffic from Mattapan to take classes at Boston College. Not that he told his father about his struggles. Similarly, Michael Blackwood didn’t seek advice when he decided to reduce his course load to two evening classes during the fall of his junior year. And just like that, by simply changing his status to part time, he had forfeited his full ride to BC. It was something he could have — maybe should have — known. Full-time enrollment was written in black and white as a requirement of a need-based scholarship. But, like many kids, he hadn’t paid attention to the fine print, and there had been no one — no parent, no teacher, no mentor — to guide him. In such a situation, according to BC spokesman Jack Dunn, the college would typically reach out to the student to find a solution. Blackwood said he has no memory of that. He could have challenged the loss of his scholarship but didn’t think to do so. He didn’t come from a family with connections, a family who knew how to work the system. He lacked the ingrained sense of personal agency, and entitlement, to challenge the loss of funding. He just accepted it. The only choice Michael had, he believed, was to press on. If staying at BC meant paying out of pocket, that’s what he would do. So, with half the credits he needed to graduate, he began to borrow money to get the rest. But in the fall of his fourth year on campus, after borrowing and paying on his own for five more classes, Michael had reached a breaking point. In the past, he’d resisted the temptation to take a break from school. Now it felt like the only option. But the obstacles and distractions kept mounting. Rohan, his older brother, was in jail. His father’s house fell into foreclosure, as did the house of his late grandmother in Florida. Collection agents came after him for the money he’d borrowed for BC. His credit went to hell, and he ended up in a custody battle with the mother of his young son, Amari. Blackwood took a full-time job as a security guard, spending long, monotonous days while the pre-med students he’d known at BC were graduating and well on their way to earning their white coats. By September 2012, Blackwood was 24 years old and barely two-thirds of the way to a bachelor’s degree. His debts were mounting and he’d been forced to leave the security guard job after a dispute with his boss. Then he remembered that an uncle had once joined the Army to escape a bad financial situation. The more he looked into it, the more it seemed to make sense. Signing up, he learned, would allow him to defer his student loans, give him money for college when he returned to it, and protect him from creditors. He enlisted on an eight-year contract, shipping out for basic training in November 2012. He’d been dating a girl named Brittany, the cousin of a Cape Verdean friend from his BC dorm. They married quietly at City Hall before Blackwood left for a deployment to Korea. 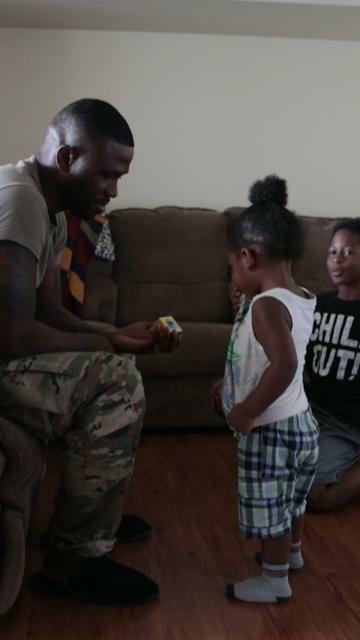 In 2014, Blackwood was assigned to a base in Maryland, where Brittany joined him, giving birth to their son, Micah, in 2016. Eleven years after graduating at the top of his class at Hyde Park, Blackwood finished his degree online, receiving a bachelor of arts in liberal arts/liberal studies from Thomas Edison State University in the spring of 2017. Today, Michael Blackwood wears a sergeant’s chevrons, a valedictorian with a different dream. 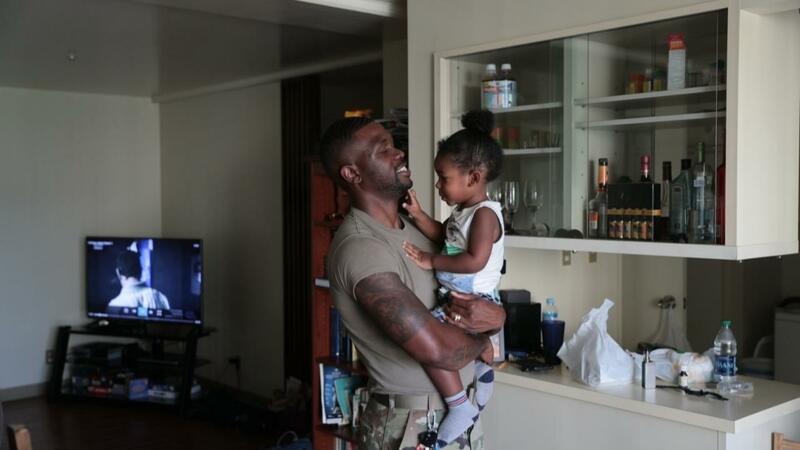 In a dozen years, he hopes to be a warrant officer, and in another dozen retired with a pension — running a little business in Boston with Brittany. When he left in 2012, he felt as if he were drowning. Now he is 7,500 miles away, with a day job he never imagined — sitting before a pair of wide monitors in a scuffed and fluorescent-lit office. A football in the corner is one of the only nods to his old life. 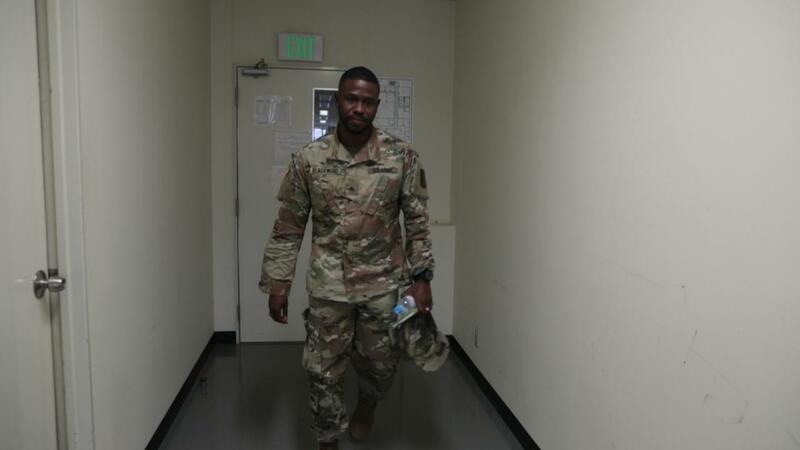 As a noncommissioned officer, he now leads a small platoon that helps maintain the military’s secure communications network in the Pacific, 13 soldiers and a dozen civilian employees and contractors. It could be a desk job in any IT warren anywhere, if not for the camo uniforms, the mandatory 6 a.m. workouts, and the assault-weapons training. On the best days, he gets to fix things in the field and mentor young men and women. Other days bring endless meetings and paperwork, but it feels good to earn a paycheck. And the Army is one of the few things in his life that has worked out as planned, fulfilling its half of the contract with financial stability, opportunity, and a predictable track. 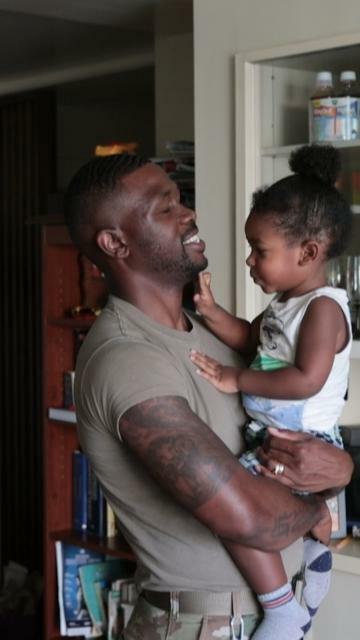 For the first five years, he could only see his son Amari through FaceTime. That changed in 2017, when he and Amari’s mother agreed that Okinawa represented a great opportunity for the boy. Now, halfway through a three-year stint, the family has embraced living on the island, exploring far beyond the military base or nearby “American Village” complex where off-duty soldiers and families tend to flock. With housing and other benefits, he can stretch his modest salary considerably, paying off loans and even investing a bit. Brittany works weekend nights at a nearby nightclub —more to keep from going stir-crazy on the base than for the money. So Blackwood does his share of weekend parenting, leaning on 10-year-old Amari for help with Micah. Blackwood’s reward, after diaper changes and bedtime, is to slink into a recliner, don a headset, and play video games for hours, bantering with online friends while nursing whiskey on the rocks. That was the plan on a recent Saturday night, with Micah asleep and him sitting down for takeout with Amari and a visiting Globe reporter. Malcolm Gay can be reached at malcolm.gay@globe.com. Follow him on Twitter @malcolmgay. Meghan Irons can be reached at meghan.irons@globe.com. Follow her on Twitter on @MeghanIrons. Follow Eric Moskowitz on Twitter @elmoskowitz. When being smart, working hard, and finishing first still isn’t enough. None of the Boston valedictorians who dreamed of becoming a doctor has earned a medical degree. A select few go to Boston’s prestigious exam schools. Everyone else swims in a sea of mediocrity. Even valedictorians sometimes feel like they don’t belong in college. Low-income, immigrant students can falter even after success. The Valedictorians Project was reported and written by Malcolm Gay, Meghan E. Irons, Eric Moskowitz, James Vaznis, and Michael Levenson of the Globe staff. Additional reporting by Amelia Nierenberg and J.D. Capelouto; data analysis by Todd Wallack; research assistance from Thomas Oide, Emily Williams, Marek Mazurek, Sophia Eppolito, Alexander Lim, Patrick Strohecker, Jackson Cote, Jeremiah Manion, Zipporah Osei, and Kayla DiPilato.